Tickets can help you gather information for your CRM. 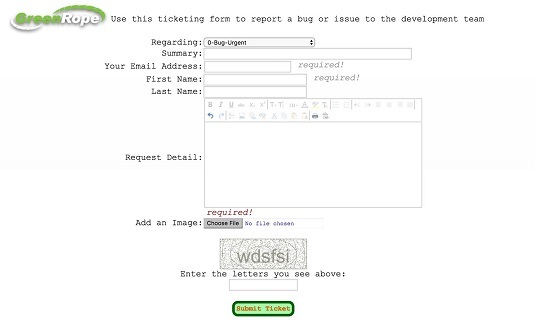 Ticketing uses forms to track an “issue” that is created by filling out the form. This “issue” could be interest in your product, or it could be someone having a problem with a product you sell. In either case, you want a person from your company to engage with the person filling out the form and manually close it. The image below shows a form for customer service that can help you with capturing new leads. Ticketing forms are by their nature single opt-in, meaning no confirmation email is required. When used in the context of sales, they ensure your sales/customer service team always engages with leads. Tickets opened this way must be manually closed, which means you can see at any given time how many tickets are open and who they are assigned to. It’s an effective way to enforce lead follow-up, ensuring no leads fall through the cracks. Ticketing forms encourage better lead nurturing and follow-up. Good ticketing systems also include average response times in their reporting, which helps to ensure fast follow-up when leads and clients reach out to your organization. In addition to having someone manually close each ticket that is opened, be sure to schedule workflows and/or marketing automation when people fill out your lead capture forms. Ticketing forms create a more consistent user experience and strengthen your brand, while providing a convenient way to provide educational content to the people who fill out your forms. Just as you want a human in the loop to confirm a new lead, you also want a human to confirm that when a lead has a problem, it was resolved, and how it was resolved. Ticketing forms gives you this ability and are an effective tool for ensuring the best customer experience possible. By encouraging your customers to use ticketing forms, you ensure that no issues get ignored. You can measure time to respond to the ticket, as well as ask for feedback after the issue was resolved to measure quality of service. Customers feel valued and their voices are heard, which improves your brand overall satisfaction with your company. Below, you see a summary of a ticket. Your CRM should be able to easily call up tickets to see status and if they were resolved, how they were resolved. Exit ratings for tickets help you get an idea if the customer is happy now. A summary of a ticket. In both types of applications for ticketing forms, build in automation. For example, a workflow that schedules a CRM activity, sends an email, sends a survey, or any combination. 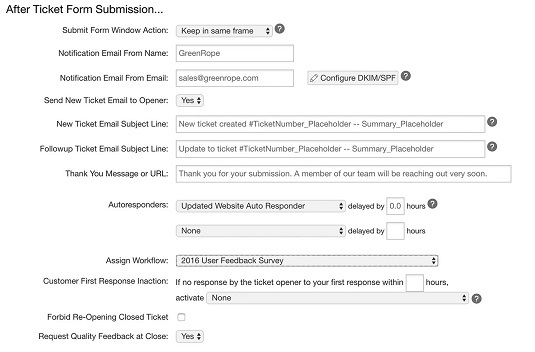 Ticket form options that customize messaging and activate workflows. Automated follow-up messages to your leads and clients are opportunities to cross-sell, up-sell, and/or educate, but be careful to not overdo the selling part. People who fill out forms, particularly for support, don’t want to be inundated with “buy this” messages.